Leak-tight 45 mL tamper evident vials are closed in the mold during manufacturing to form a hermetic seal, including a plastic filament that connects the hinged lid to the base of the vial. Once opened, the plastic filament will separate, indicating the first time the vial has been opened since leaving the mold. 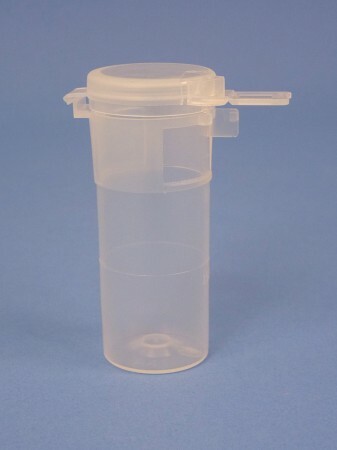 Each vial is graduated at the 15 mL and 30 mL capacity level and the virgin polypropylene enables clear visibility into the collected specimen container. The 45 mL Transport Vial is the industry choice for secure collection and transport. 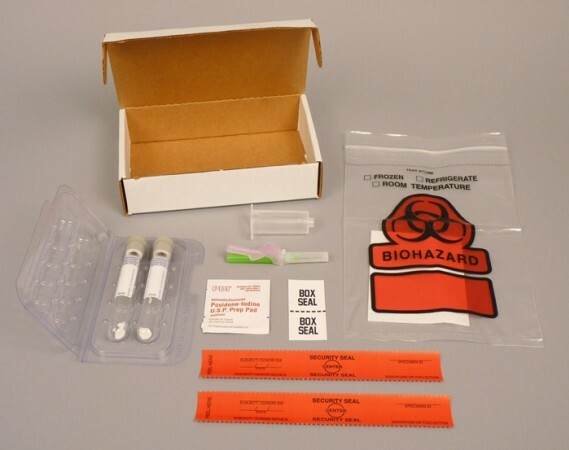 Therapak’s Blood-Alcohol kit includes all necessary components for the collection and transport of blood samples collected from suspect DUI offenders. Kit contents includes 2 16 x 100 mm, 10 mL gray top evacuated blood tubes (Sodium Fluoride – Potassium Oxalate preservative in each tube), blood draw needle, needle holder, iodine prep pad, plastic tube holder, 2 evidence seals, box seal, transport bag with absorbent material, marking labels, and transport box. All components are sealed in a bag inside the box. Compliant for shipping by ground or air in accordance with Exempt Human Specimen shipping regulations. 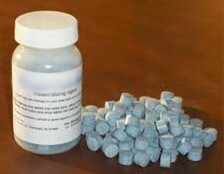 Therapak’s Bulk Supply Kits provide the most economical drug testing supply solution in the industry. Bulk packaging means that items are nested and packaged in a manner to reduce assembly costs while providing case quantity dimension reductions as compared to other kits being offered in the substance abuse testing market. Freight costs are a major consideration in transporting kits to your facility and from your facility to client locations. These space-saving Bulk Supply Kits are the answer to your cost reduction initiatives. Choose from three different packaging configurations for both single and split collection applications. Packaging configurations include case quantities of 25, 50 and 100. 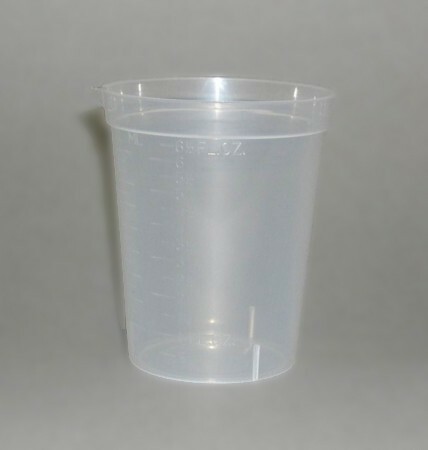 Single Bulk Supply Kits include individually wrapped beaker collection cups with temperature strips, specimen transport bags with absorbent and 45 mL tamper evident vials. Split Bulk Supply Kits include individually wrapped beaker collection cups with temperature strips, specimen transport bags with absorbent and two 45 mL tamper evident vials. For more information, contact us at info@therapak.com to learn about customized kits, requisition printing and direct shipping via Therapak’s Online ordering systems. Therapak’s foil-top kits include a 240 mL beaker style collection cup with pour-spout and temperature strip. Each kit is sealed with a peel-off foil-top lid that secures the kit contents. The single specimen collection kit features one 45 mL tamper-evident, flip top transport vial and transport bag with absorbent material. 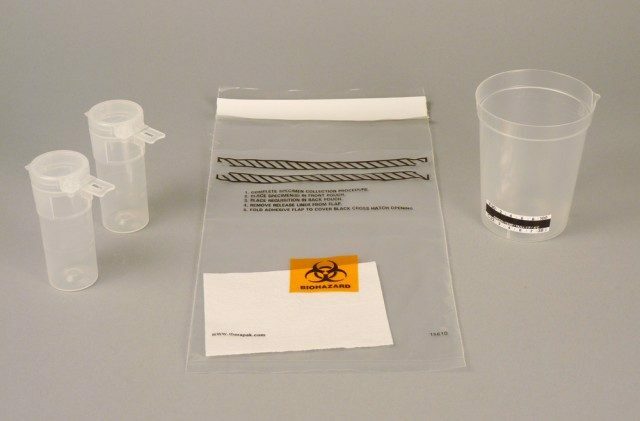 The split specimen collection kit includes two 45 mL vials and a transport bag with absorbent material. Flip top vials are graduated at 15 mL and 30 mL capacities. Also available as box kits. 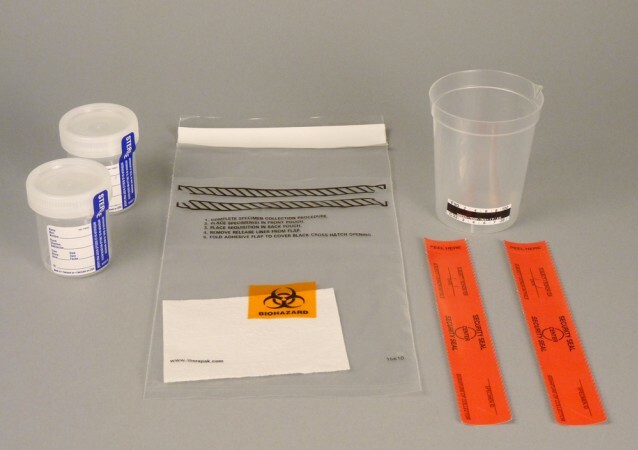 Single Specimen Collection Kits can be used in conjunction with on-site testing products or remote site collection when specimen is transported to a laboratory for analysis. 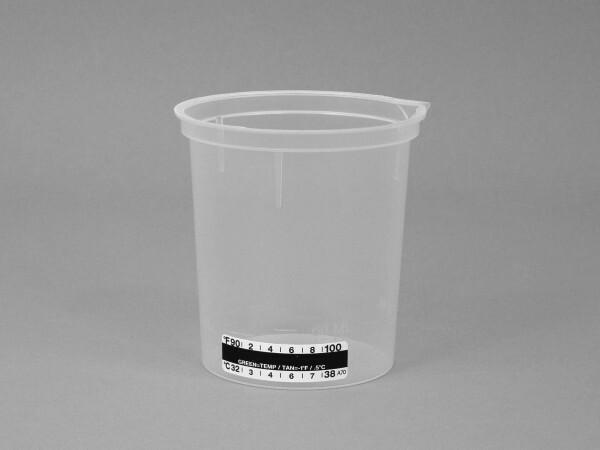 Each kit contains either a 180 mL beaker style collection cup with pour spout or a leak-resistant 90 mL sterile container with cap and integrity seal. The transport bag features two sealable, tamper evident pockets and comes with absorbent material. The individually bagged kits are available in various configurations. Therapak assembles Non-DOT, DOT and SAMHSA compliant collection and transport kits using the popular 45 mL capacity tamper evident vial. The vial is constructed of virgin polypropylene that results in excellent clarity for visibility into the collected specimen container. Each vial is graduated at the 15 mL and 30 mL capacity level. Kit configurations include a two-pouch specimen bag with absorbent, a 180 mL beaker style collection cup with pour spout and either one or two 45 mL vials depending on whether your requirements call for single or split collection kits. Kit components are heat-sealed in a bag to protect the integrity of the components. Individual box kits are also listed below. To customize the box or specimen bag with logo information, contact us at info@therapak.com to review minimum volume and lead times. 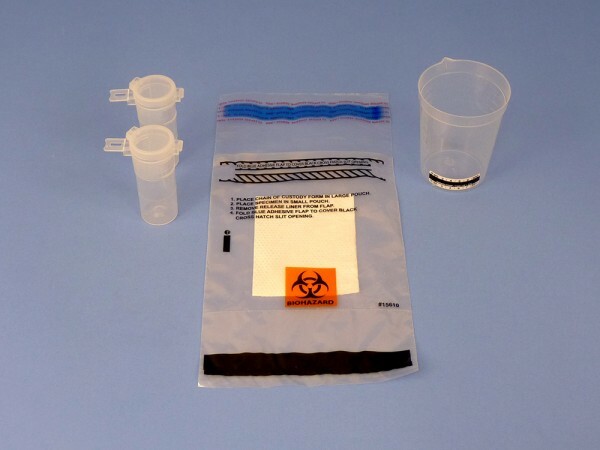 For drugs of abuse testing applications requiring two samples to be collected from a single donor, Therapak’s split specimen collection and transport kits are available in either a split bag kit (40002) or the same kit within a transport box (40011). 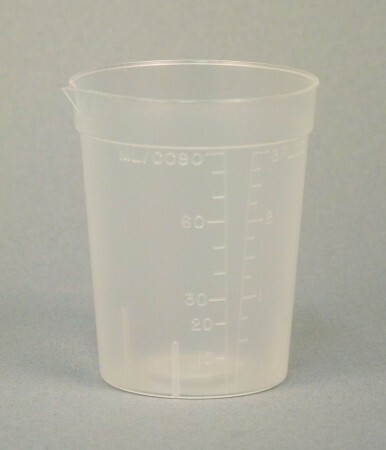 Kits include: 6.5 oz beaker style collection cup with pour-spout and temperature strip, two 60 mL sterile containers with sterility seal, and a transport bag with absorbent. 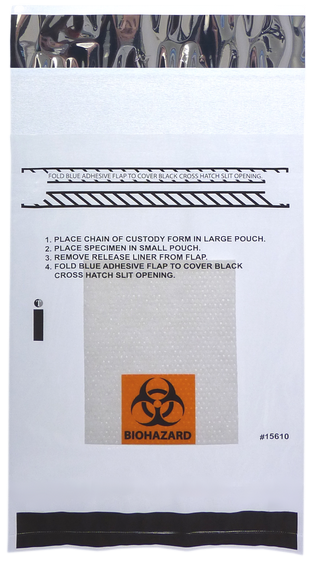 Therapak’s Tamper Evident Perforated Security Seal is an ideal solution for your chain of custody drug testing procedures. Featuring convenient and strategically positioned perforations, your sealed vials and jars will open with increased ease and comfort. The seal includes areas to fill in Donor ID information such as Donor’s Initials, Collector’s Signature, I.D. or SS#, and Date field. Printed on bright white paper, markings are clear, facilitating increased readability. These easy peel, self-adhesive seals provide powerful adhesion to your vials and jars, ensuring tamper evidence. 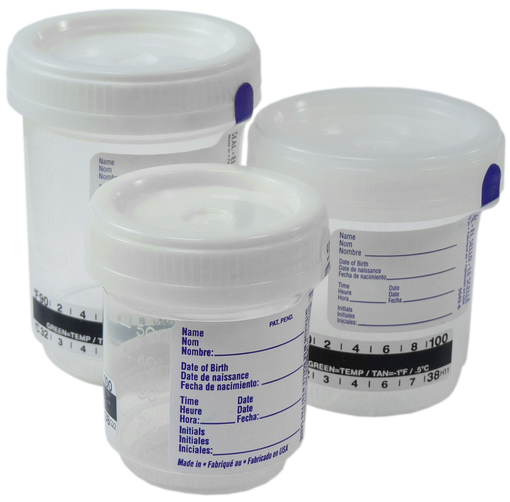 Available in two sizes and two packaging quantities, these tamper evident seals are used for chain of custody procedures in drug testing. The seals identify the presence of any tampering with the specimen containers or vials from the moment they are sealed until they are opened at the testing laboratory. After annotating the seals with donor identity information, remove the red adhesive seal from the liner and apply over the top of the urine container or vial. Press the adhesive on to the sides and top of the vial until securely snug. Immediately after application, the tape will not be removable without showing signs of tampering. Each kit contains the necessary collection and transport components to effectively collect, store and transport the hair specimen to a testing laboratory for analysis. 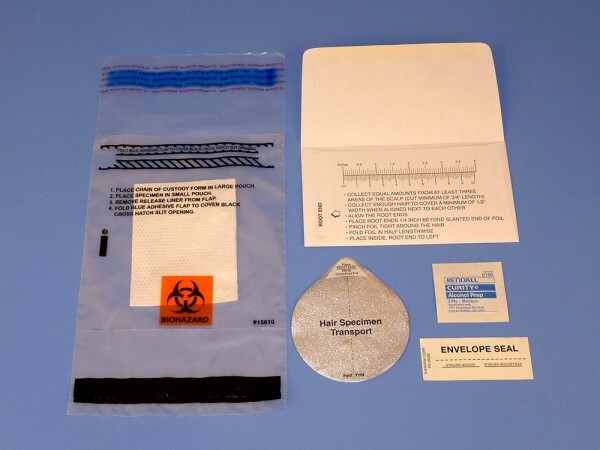 Therapak’s kit features: a sample acquisition envelope complete with instructions, an envelope seal, a round foil cinching sheet, an alcohol prep pad and a specimen transport bag. 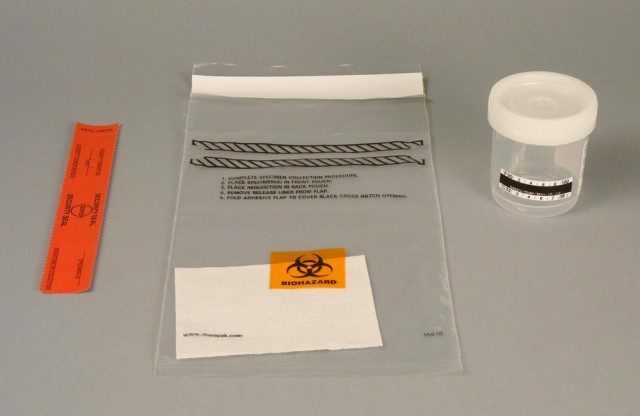 Both the sample acquisition envelope and the envelope seal provide collector and donor chain of custody to insure that each self-contained sample is secure for tamper-evident transport. Drug screen transport boxes are shipped flat to reduce freight on outbound transit to the collection site. These easy to erect boxes are suitable for transporting single or split specimen test samples from the collection site to the laboratory. Boxes can also be used for kit packaging of single and split collection kits. Inclusion of all patient forms, requisitions, and instructional leaflets. In the treatment of pain management, physicians regularly prescribe a range of drugs to improve patient health. Several of these drugs including opioid medications have been linked to compliance risks in the pain management sector. Diversion of drug to others for sale or use is a serious risk confronting healthcare practitioners. 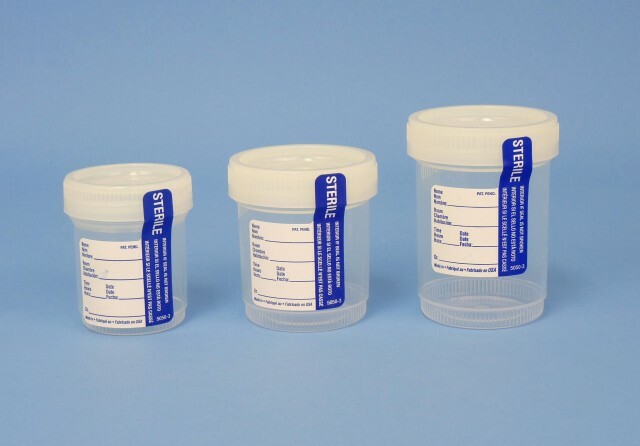 Prescription drug abuse is also one of those risks that requires prescribers to engage in managing the problem through periodic urine drug testing. For physicians who oversee patients suspected of abusing pain medications, it is time to consult with your local or regional drugs of abuse testing laboratory to commence a reliable drug monitoring program. Urine toxicology testing can enhance the delivery of pain treatment and protect the interests of physicians. It is a known fact that illicit drug use is on the rise and a routine patient drug monitoring program can help physicians become less vulnerable to regulatory implications by obtaining proper evidence that a high standard of care is being provided to the patient to guard against patient misconduct or abuse. An effective drug monitoring program enables physicians to monitor a wide range of pain medications in addition to prescribed opiates. Choose from three stock kit choices featuring the Dual Click-Tite specimen containers – a 60 mL x 53 mm container with temperature strip in kit 39485 and a 90 mL x 53 mm container with temperature strip in kit 39486. The Pain Management or PM Tube Transport Bag Kit 39487 features two 10 mL transport tubes, a collection cup and temperature strip. 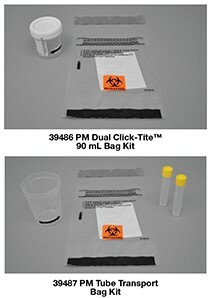 All three kits include a two-pouch specimen transport bag with absorbent. These kits are all assembled on an automated production line in a sealed bag and packed 100 per case. Branding and customization of all pain management kits available upon request. Designed for drugs of abuse testing laboratories, the MA-300 system protects the integrity of patient specimens while increasing processing efficiency. If deployed in line with existing accessioning workstations, a single operator performing accessioning and running the MA-300 can process up to 200 samples per hour, depending on the speed of the lab’s accessioning process. 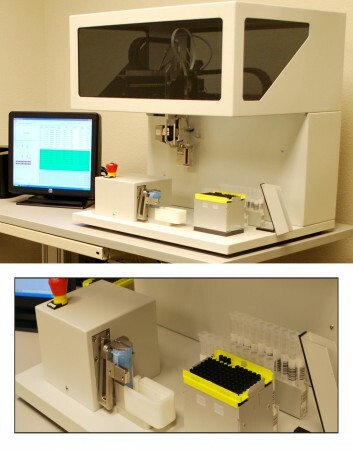 The efficient, open design of the MA-300 allows an operator to accession and aliquot incoming specimens simultaneously. Each incoming sample has a touch time of 2-3 seconds per vial with a total cycle time of 18 seconds. The MA-300 ensures the sample’s chain of custody with a two-step barcode reading system. A barcode reader travels with each aliquot from the specimen vial to the compatible Olympus or Hitachi analyzer test rack. The MA-300 performs batch creation and generates a batch record that can be stored or transmitted to a location in your network in either of two formats — an electronic comma separated variable file (CSV file) or hard copy print out. The light bench-top machine with a footprint of 5 square feet weighs less than 125 pounds with touch screen computer, which enables you to include several high-volume MA-300 workstations in your lab. The MA-300’s Tecan’s Air Displacement Pipetting (ADP) technology eliminates many potential repair tasks and routine maintenance inherent with other specimen processors. The ST-10E is designed to decrease waste output at drugs of abuse testing laboratories. Instead of multiple employees spending hours discarding samples, the ST-10E enables a single operator to process 500 pounds of containers or vials per hour. Following storage of the test containers, the operator simply places a tray full of containers filled with nonhazardous nonflammable liquid, such as saline or urine, into the hopper. The system does the rest: liquid waste is discarded directly to a drain or holding tank while the 45 mL to 1 liter plastic containers are ground into dense pieces. The hex shaft maximizes knife placement options while offering more strength, size for size, than a keyed shaft. The 17” cutting chamber handles a wide range of product sizes. The ST-10E control panel features illuminated function buttons, keyed power switch, fused lockable disconnect, hour meter, and programmable logic controller for shredder functions, including knife reversal on overload. Machine maintenance is easy, as bulkhead walls and barriers at either end of the cutting chamber can be replaced without the need of gearbox disassembly. The resulting compact plastic shards take up significantly less space than intact containers, which means you can fit more waste in your trash and thus decrease your waste removal expenses. 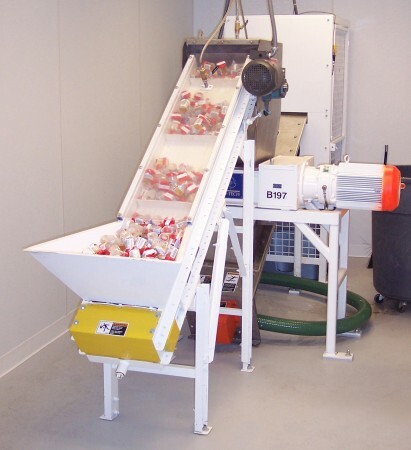 Start saving your laboratory money by compacting waste! Temperature Indicator Strips indicate the temperature of the specimen within minutes after the initial collection. 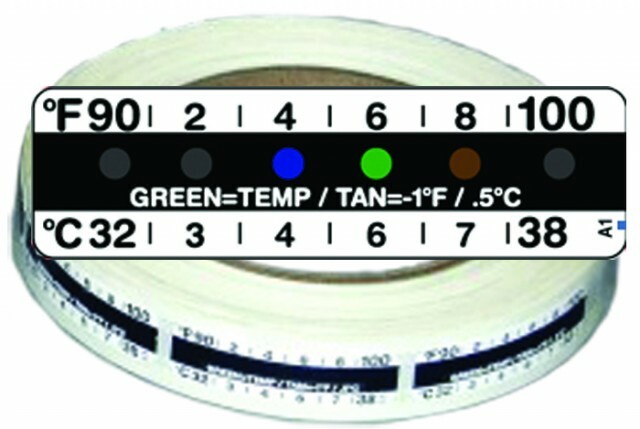 As an integral part of the drug testing process, the temperature indicator strip confirms that the voided specimen was indeed within temperature expectations eliminating doubt at the point of collection that a specimen was subject to adulteration. Temperature readings can be viewed in both Celsius and Fahrenheit. These 6 x 9″ polyethylene specimen bags feature a removable, adhesive release liner that secures specimen containers in a liquid-tight primary pouch. Fold and insert requisition in second pouch. Once the bag is sealed, both pouches are tamper-evident which provides protection of specimen and sensitive patient information during the transport process. Each bag comes with a 3 x 4” absorbent sheet.